A sophisticated Israeli food and drink experience. 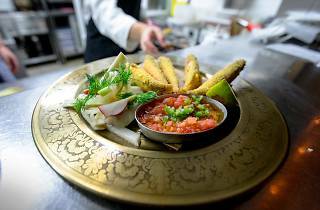 For those who crave an upscale twist on Israeli comfort food, and an exceptionally rich wine and spirits list to match, Sasson Bar is the place to spend your evening. This urban bar with a homey, yet elegant, atmosphere has endless options of good food and drink, and is perfect for a special outing in the upper city. 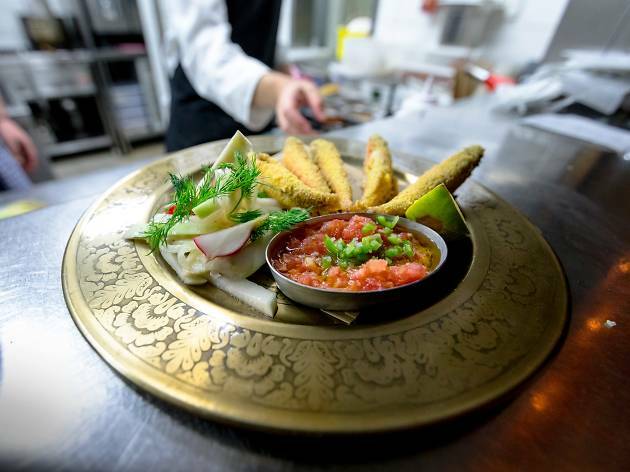 Try their calamari – served seared and not fried, with a dollop of crème fresh and baby greens (a definite winner), or their shrimp risotto flavored with yellow turmeric to remind you how good Israeli fusion cuisine can be. If the wall of whiskey or tempting wine cellar options are not your thing, try one of their craft cocktails, which err on the side of light and refreshing, made with high-quality liquors and delicate garnishes.